he Connections Menu on the top-right of your screen is your gateway to quickly accessing the various "connections" that your phone can make, along with some additional data around the current date and battery level. 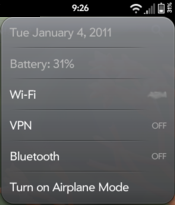 As you can see in the screenshot, you have quick-access to your Wi-Fi, VPN (in webOS 2.0 and above) and Bluetooth settings, as well as the ability to toggle Airplane Mode on/off, all without leaving the application that you are currently in. 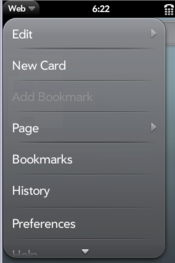 The Applications Menu on the top-left of your screen is a drop-down menu that is unique to the specific application you are in. For most applications, this may only provide you with an "Edit" submenu (for Copy, Paste, etc), a "Preferences" option, and a Help link. However, as you can see in the screenshot for the "web" application, there are also a lot of additional functionality that is opened up to you just by swiping this menu down. There are also some Homebrew patches that will modify or add additional dropdown menu's to your device, such as the Top Bar System Menus by Sconix.